Don’t you just wish everything was easy to do over again when things get screwed up? 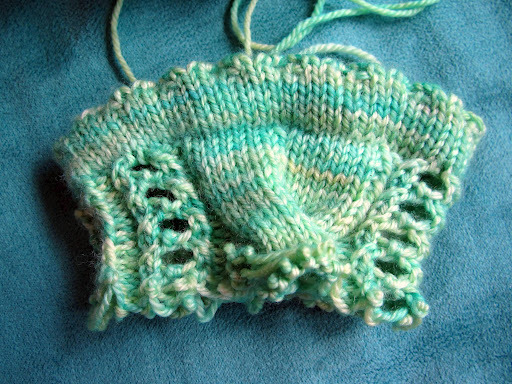 The nice thing about knitting (as opposed to life) is that you can have such do-overs. The sucky thing is it all takes time, time, time. This is the start of my next sock design and it just doesn’t work. That big ol’ cable in the middle is much too big, it’s a pain in the knuckles to work and makes for a wonky-looking sock. I’ve already ripped back and hit the drawing board again. I’ve got a different idea now, but no will left to make it happen. My knitting finger is still a bit sore from my blue crab attack, so I’m trying not to overdo it in the first place, but I also just don’t want to sit around knitting anymore. It’s a beautiful Monday, I have off from work but my Fiasco does not, so what am I to do? Chores are unappealing at the moment, working at the computer is unappealing at the moment, job searching is unappealing at the moment (thought I really should be looking)… There may be a do-over possible for the sock, but not for this day, so I’m going to get up and go for a walk or something. The laundry and dishes and knitting and patterns and jobs will wait. Nothing like shiny new silk hankies to motivate one to finish the fiber that is currently occupying the spindle! What do you wish you could do-over? This entry was posted in MyDesigns, spinning by shoelaceswitcher. Bookmark the permalink. Sorry you were so unmotivated, I felt the same way this weekend. I really wanted to get more done on the top I started but I couldn't get it to happen. 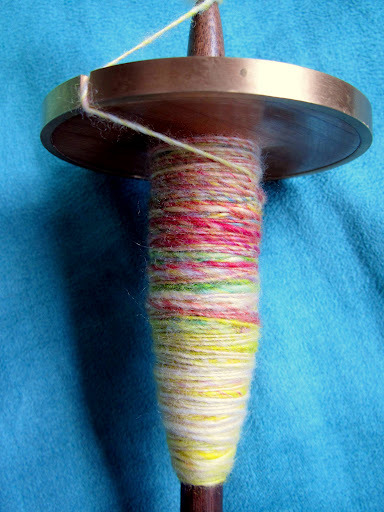 BTW I love the bugga you are spinning, it's really simple and pretty! I hope you overcome the sock problem, that yarn is so pretty I'd hate to see it sit there unused. Haha, don't worry, I'm back on the sock train. I love the colorway, too!